The yellow school bus is an iconic image for picking up and dropping off students every day — and now it’s getting even better. Google has started a new initiative that puts that commute time to use. 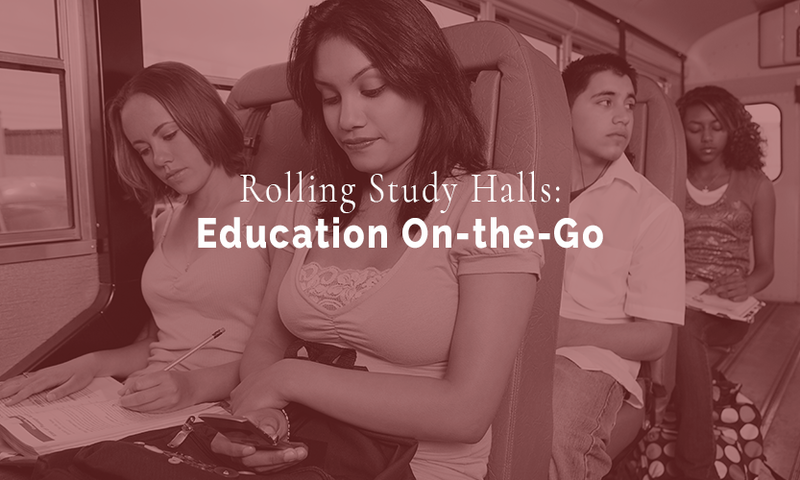 Called “Rolling Study Halls,” the program powers school buses with WiFi routers, data plans, mobile devices and onboard educator support to give students more learning time while on the bus. Targeted toward rural communities where many students have long commutes and don’t have Internet connectivity at home, Google’s program is aimed at reducing the “Homework Gap” that disproportionally affects low-income students. The program piloted in North Carolina and South Carolina, and Google’s early results show promising increases in reading and math scores, as well as better digital fluency. Now the program is expanding to 16 more school districts in rural areas across the country. Even if the program hasn’t hit your area yet, students can still productively use their time on the school bus. Discuss these three ways to make the most of a commute. Even though more teachers are assigning homework with digital components, classwork is still largely based on textbook learning. Students likely have at least one subject with homework that requires reading, and as long as they don’t feel sick reading in a moving vehicle, they can take this time to focus quietly on the words on the page. Even without Internet access while on the school bus, many students still have access to a mobile device that stores information, such as podcasts or videos. Students may take these learning moments directly from class or take advantage of the thousands of online learning resources that offer information about the subject of their choice. Forget the devices and the books. Students can take advantage of a peaceful school bus ride to and from school by visualizing and dreaming about what matters to them most. This could be a good time to imagine a perfect score on a history test, a game-saving score during playoffs, or a future career based on their favorite subject in school. Most importantly, students should learn to enjoy their school bus time as an extended school period where they can feel comfortable, catch up on homework if needed, and ramp up for or wind down from school. To learn more about how SafeStop is improving the bus ride to and from school, reach out to us today or request a demo.